On Friday, Aug. 30, a gathering of elected officials, federal agencies, partner organizations and grape growers will celebrate the transition of bittern ponds to restored bay lands with the flow of recycled water through a new pipeline to the Napa Sonoma Salt Marsh. The former Cargill salt pond complex at the north end of San Pablo Bay has the potential to provide diverse wetland habitat, but the area wasn’t able to be fully restored without clean water to eliminate the bittern left over from the salt production process. The event, hosted by the Sonoma County Water Agency and the Sonoma Valley County Sanitation District, commemorates 3.4-miles of pipeline that extends an existing recycled-water pipeline. 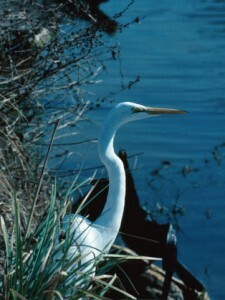 The new pipeline is being constructed to deliver recycled water for salinity reduction and restoration of 640-acres of bittern ponds, part of a larger 10,000-acre restoration project. Connections for agricultural irrigation along the pipeline route will also provide grape growers in the Carneros Region with a resilient source of clean water for irrigation. The Aug. 30 event will be held at the Napa Sonoma Marsh near Buchli Station Road and Highway 121 from 10 to 11:30 a.m. For more information about the event, contact Ann DuBay at 524-8378 or ann.dubay@scwa.ca.gov or Brad Sherwood at 547-1927 or brad.sherwood@scwa.ca.gov. To find out more about the 10,000-acre Napa Sonoma Marsh restoration project, visit napa-sonoma-marsh.org. For more information on how recycled water is being reused in the North Bay, visit nbwra.org.